Today is Trinity Sunday. It’s one of a few “Church days” that doesn’t recall an event like Christmas, Good Friday, Easter, and Pentecost. Instead, Trinity Sunday celebrates the nature of our God. The danger of a Sunday like this is that I could try to sound intelligent and attempt to explain the Trinity, which a mystery, or I could show you a video and let a few Irish Lutherans explain it. It is hard for us, as mortals to grasp the nature of God. One of the attributes ascribed to God in the Westminster Larger Catechism is ‘incomprehensible.” As mortals, created by God, we can never fully understand the Almighty, which is humbling and makes me wonder sometimes what I’m doing up here. It’s an impossible task, but thankfully God helps out. For you see, although there will always be a mysterious aspect of God, we know enough through revelation to understand that we have a God who desires a relationship with his Creation and especially with humankind. God the Father continually reaches out through Creation, through the sending of his Son, and the sending of the Spirit. One God who is revealed to us in three persons. Today’s scripture is from the fifth chapter of Romans. Here, Paul refers to the work of all three persons of the Trinity, showing us that we worship a God of mercy. God loves us and reaches out to everyone. Read Romans 5:1-11. Paul sets up this passage in a way to repeat, build upon, and re-emphasis his first statement – “We have peace in God.” Our text is a salvation hymn to the God who loves you and me so much, the God who became a man in the life of Jesus and died for us… God, the Creator, the Father: God the Savior, the Son: God whose presence, the Spirit, loves us and reaches out to us even when we are evil and sinful! 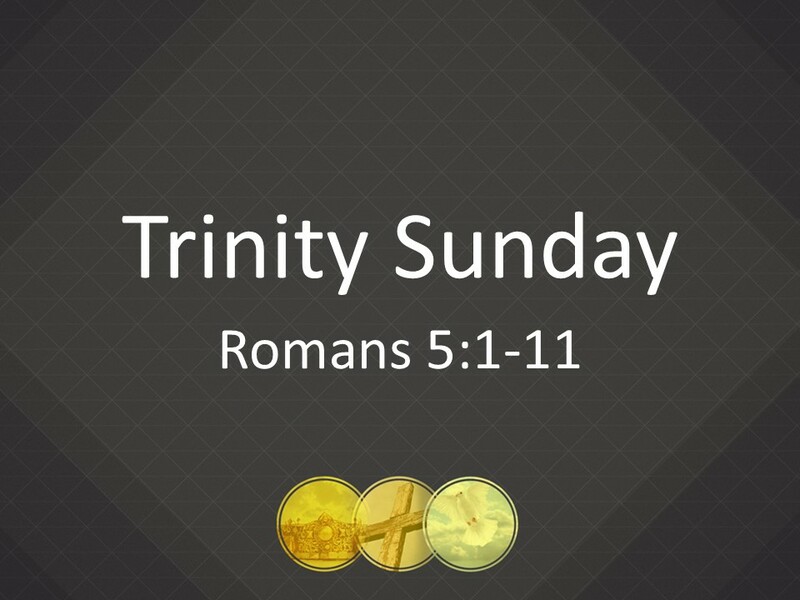 Today, the Sunday after Pentecost, is Trinity Sunday. As we’ve already seen in that silly video, trying to explain the Trinity can get us into heresy real quick. The working of the Triune God is a mystery and on this Sunday, we’re to be reminded of the mysterious ways of God who we know as Father, Son and Spirit. In this passage, which is a summary of our Christian faith, Paul speaks of all three persons of the Trinity. God, our Creator, loves us, as shown in the life, death, and resurrection of Christ. God’s love for us is poured into our lives by the Spirit, who provides the foundation for our happiness, our peace, and our salvation. Explaining the Trinity, which is a mystery and beyond our comprehension, is hard enough so I’m going to spend the sermon discussing what it means to have peace with God? This too isn’t exactly easy to understand, but since peace has a lot to do with our response toward God, it’s something we have some bit of control over. In the gospels we have the account of Jesus asking, “Do you think I came to bring peace to the world?” followed by his answer, “No, not peace, but division.” The history of Christianity has been one of division and even warfare. This seems to stand in contrast to Paul’s statement that says we can have peace in God. This is where the skeptics’ challenge of our faith is the strongest. Worldly evidence does not point to Christianity, on a whole, as a path to peace… So what does Paul mean? Let’s look at the first three verses again. In the first verse Paul sets up his hypothesis. The passage reads, “Since we are justified by faith.” Romans begins with Paul telling us how bad we are and then how we are justified, not by doing good deeds to wipe away our sin, but through faith in what Jesus has done for us. “We have peace in God through our Lord Jesus Christ.” There are three parts to this verse: 1. Justified by faith; 2. Peace in God; 3. and it’s all through Jesus Christ. Paul reminds us that God’s standard for judging is not righteousness but faith. Faith is the reason we can have peace. But to achieve this we must believe and trust in something other than ourselves. Paul has already reminded us in Romans, over and over, that we are not capable of doing much as humans. Our peace and salvation must come from outside the self. It can only come from God as revealed through Jesus Christ. Paul doesn’t go into much detail as to what this peace will be like… If we like, we can allow our imaginations run wild and create all kinds of fantasy worlds. We’ve all have heard these before. Maybe we have even thought of them ourselves: “Have faith in God and you will become rich or successful.” “If you only have faith you will be healed.” “If you truly believe and think positive thoughts, all your problems will go away.” I think most everyone here has seen enough of life to know that we do not live in such a fantasy world. So what does Paul mean by this peace? We have to read further. In the second verse he says we now find that God has “already thrown open his door for us.” I believe what Paul implies here is that we have peace with God, but we have not yet received the full benefit of it because, as he points out in the third verse, “we continue to shout our praise even when we’re hemmed in with troubles.” Trouble and peace are not analogous terms! So Paul is talking about a different kind of peace than what we would generally think. Peace for the Christian means more than the absence of war. Actually, we should be able to be at peace even in the midst of war—whether it’s a guns and bombs war or an internal spiritual war. And we know there will be both types of war. Although the victory over evil is already won on the cross, we’ll continue to experience war until our Savior returns. Peace means wholeness; it means accepting ourselves for what we are and knowing that God accepts us in His mercy and grace when we repent. Peace means knowing that at the end of history, through Jesus Christ, we’ll be shown righteous and redeemed. But we’re not there yet. Having peace now, in this life, allows us to know the Good Shepherd is beside us, even as we travel through the valley of the shadow of death. Having peace means we don’t have to impress God. Being at peace means we have resigned ourselves to the fact that we cannot impress God with our goodness. Of course, this does not mean we should give up striving to be good. The great German reformer, Martin Luther, once wrote: “Temptations cannot be avoided, but because we cannot prevent the birds from flying over our heads, there is no need that we should let them nest in our hair.” Instead of giving up on being good, we are to give up on trying to please God and present ourselves before God as sinners who believe in Jesus Christ. John Calvin, the theological father of Reformed and Presbyterian Churches, believed strongly in total depravity. He once said the human heart is so smeared with the poison of sin that it can only give off a foul stench. We may be tempted to rise up in defense of our race and insist that we’re not that bad, but Calvin reminds us we need not a defense attorney but a physician. God, the source of goodness, has sent Jesus Christ to us as a physician to help heal us from sin. And as we trust in a doctor when our bodies are sick, we must also trust in our Savior to heal us from the sickness of sin. The peace Paul refers to comes from surrendering ourselves to God. Surrendering sounds so “un-American.” It sounds like defeat. We want to take on the world, to be optimistic. That’s okay, but we must remember we’re still human and are unable to control everything. If we think we can always have things under our control, we’re going to work ourselves to death and be unhappy and sooner or later fail. To obtain the peace Paul speaks of, we have to be willing to give up our quest for obtain happiness and security through mortal and material means, and accept the grace God offers freely. We have peace when God alone is revered and exalted and nothing else obscures God’s majesty within our lives. Contentment is the cultivation of a satisfied heart. It is the discipline of being fully alive to God and to others whatever our material circumstances. Contentment is not achieved through getting everything we want but by training the heart to experience full joy and deep peace even when we don’t have what we want. Almighty God, the wonders of your creation surround us. We are humbled. The love you’ve shown in Jesus Christ is amazing. We are grateful. Your ever-giving Spirit is present during our darkest hours. We are thankful. You know our sins. Accept us and set us free to do your will in the world. Amen. Westminster Larger Catechism, Question 7. Quote from The Message translation. Quote from Here I Stand: A Life of Martin Luther by Roland Bainton (Nashville: Abington, 1950), 176. B. A. Gerrish, Grace and Gratitude: The Eucharistic Theology of John Calvin (Minneapolis: Fortress, 1993), 47. Quotes by John Calvin from the, Institutes of the Christian Religion (1559 edition), 2.5.18 and 2.5.19. Jeff Manion Satisfied: Discovering Contentment in a World of Consumption, (Grand Rapids: Zondervan, 2013), 26.